After months of contacting officials at MassDEP, we continue to feel frustrated by their radio silence. Data collected in the Fore River Basin show alarming levels of pollutants, but these levels don't seem to alarm the agency tasked with "protect[ing] and enhanc[ing] the Commonwealth’s natural resources – air, water, land – and to provide for the health, safety, welfare and enjoyment of the people." 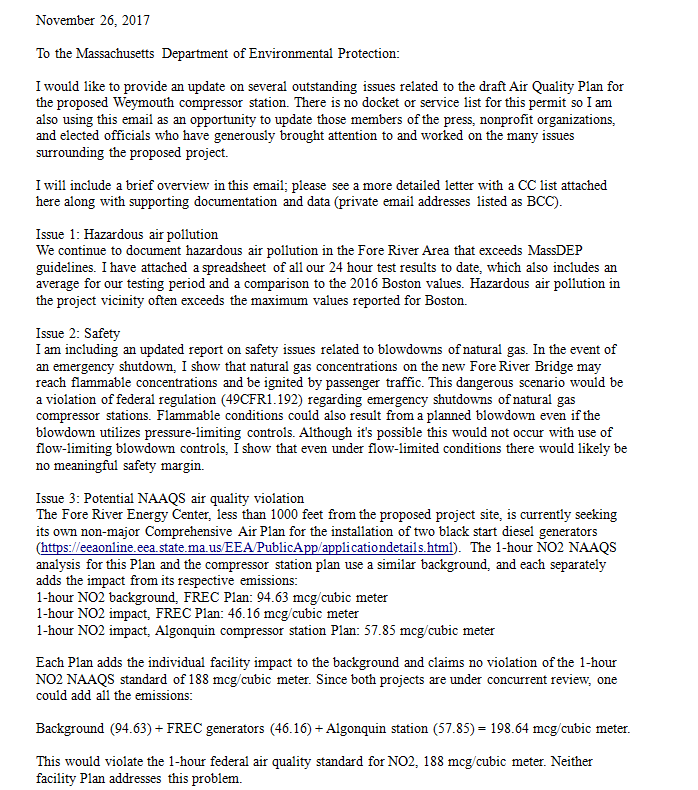 Dr. Nordgaard, along with other members of the public, have tried numerous times to initiate conversation with MassDEP officials regarding these high levels of pollutants, but they continue to do their work in secret. Last month, Dr. Nordgaard gave a presentation highlighting the risk of an explosion at the new Fore River Bridge based on air pollution modelling (you can read more about this here). This information was sent to MassDEP, as well as other agencies, but they did not seem concerned about the risk of flammability in the Basin. Their silence is not acceptable. As an agency who sees it as their mission to provide for the health of safety of people, they seem to have lost their direction. In an attempt to get them to listen, and act, Dr. Nordgaard sent a letter outlining the many concerns that we have as a community. 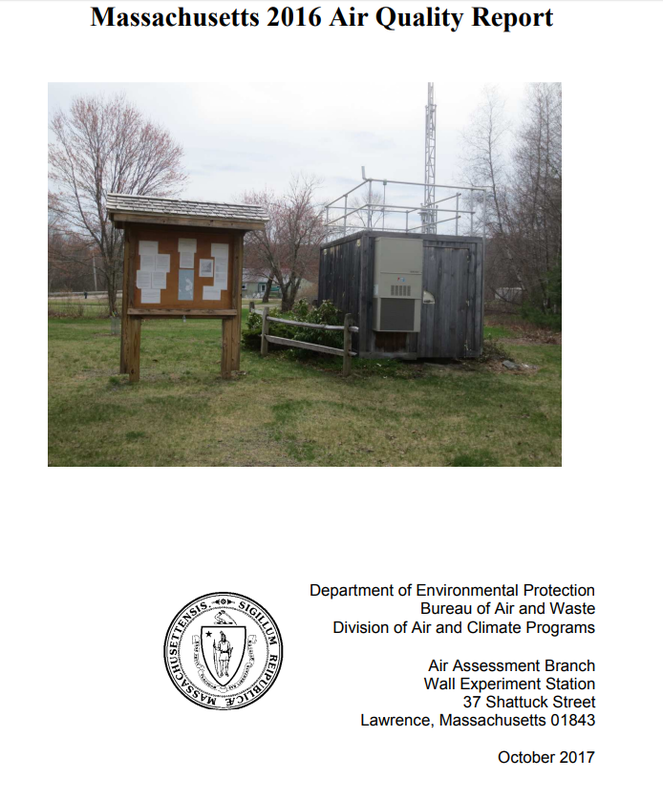 His letter included the following attachments, which are all available below: 2017 Fore River VOC Results, Fore River Energy Center Non-Comprehensive Plan Approval Application Report, Massachusetts 2016 Air Quality Report, and a Flammable Risk Analysis. We encourage you to read the letter, and to contact MassDEP officials as a follow-up. We need to hold them accountable. 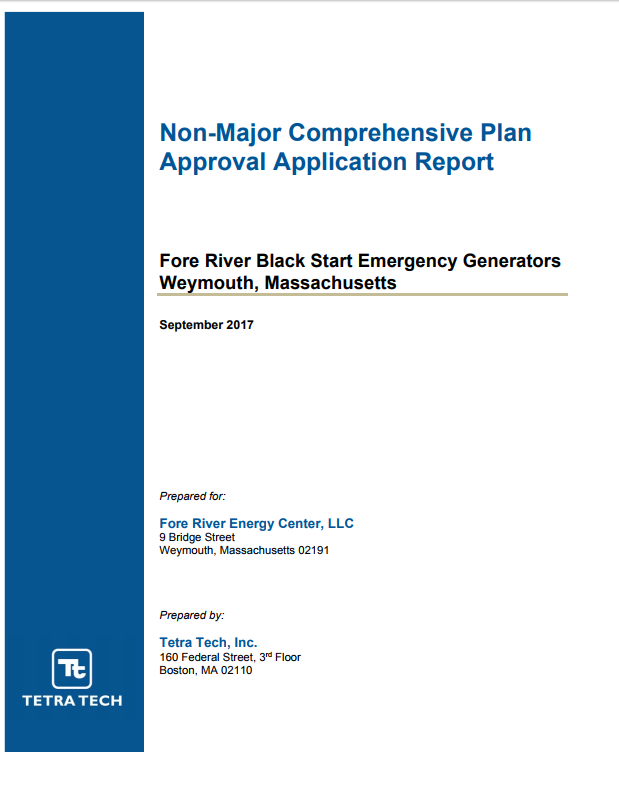 Fore River Energy Center, LLC (formerly known as Calpine) is seeking approval to install two black start diesel generators. We are concerned about the emissions that these generations would add to the overburdened community, in addition to any emissions that would come from the compressor station. The Non-Major Comprehensive Plan Approval Application Report is available here or below. Background (94.63) + FREC generators (46.16) + Algonquin station (57.85) = 198.64 mcg/cubic meter. This would violate the 1-hour federal air quality standard for NO2, 188 mcg/cubic meter. Neither facility Plan addresses this problem.